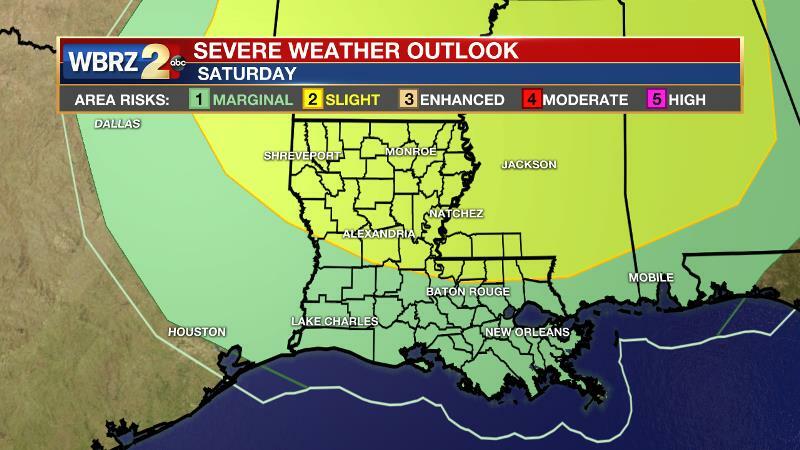 As warming is underway in the Baton Rouge area, the next forecast focus is on the possibility of severe weather. A strong storm system will affect the area this weekend. Today and Tonight: By Thursday afternoon, gradual warming will begin with highs returning to the 60s. Clouds will increase as southeasterly winds slowly add moisture to the atmosphere. A shower could even develop, mainly west of the Mississippi River. Overnight will be much warmer with lows in the upper 50s, mostly cloudy skies and patchy fog. Up Next: The week will end mild and in the 70s. An isolated shower or two will be around on Friday. The next frontal system will return showers and thunderstorms to the area by Saturday. While the local threat seems to have decreased a bit since yesterday, this system will still need to be monitored for the possibility of severe weather (see the explanation below for more). The associated front will likely do the stall routine and keep showers in the mention through early next week. Above average temperatures will continue as well. 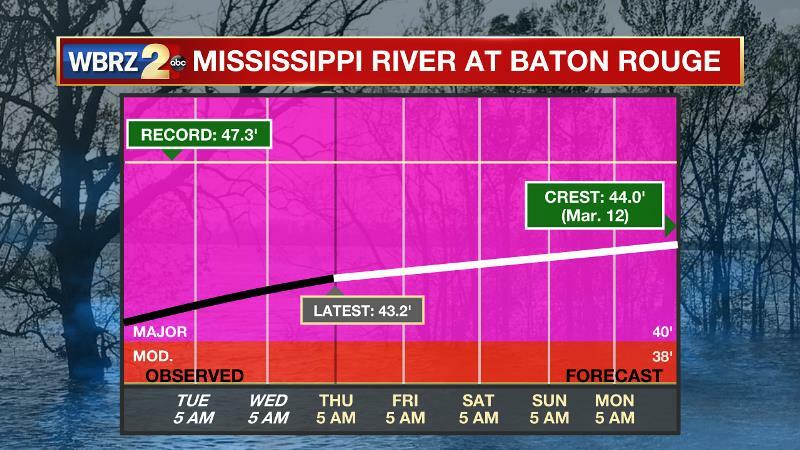 The Mississippi River: At Baton Rouge, major flood stage continues with a level of 43.2’ as of Thursday morning. Though the classification of “major flood stage” sounds scary, impacts to land are minimal thanks to levee protection. 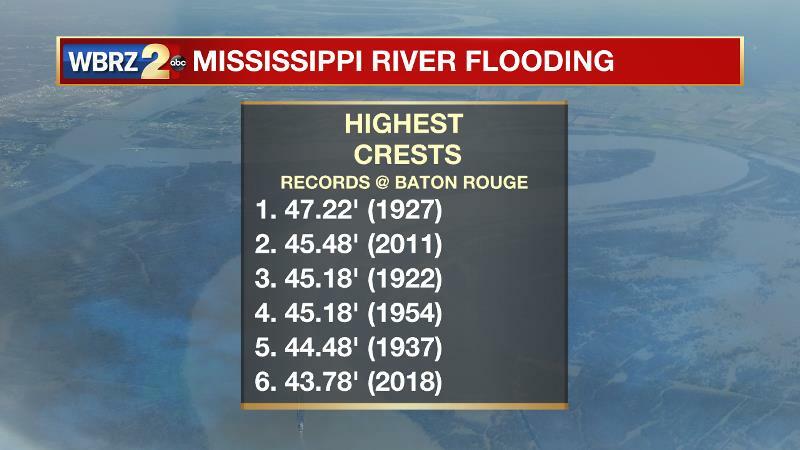 The high water is primarily an issue for river traffic and river islands as well as a few spots north and south of Baton Rouge that will turn soggy along the banks. At this time, the river is projected to crest next week at a level similar to what was reached last year around 44’. Thursday, surface high pressure will push away to the northeast and winds will slowly take on an easterly and then southeasterly component. A weak ridge will also pass over the Gulf Coast with some accompanying moisture. This will allow moderating temperatures and return of some clouds. Deep, southerly flow will continue the moderating trend in temperatures for Friday and even bring enough moisture for some fog and an isolated shower to form through Saturday morning. Moving into the weekend, a more active weather pattern will develop. A strong shortwave trough will move out of the Midwest into the Mid-South taking on a negative tilt while doing so. In response, a surface low pressure will deepen with a trailing cold front sweeping east toward the Mississippi River. A band of rain and thunderstorms is expected to push into the area later Saturday and last into Sunday morning. As far as the severe weather threat goes, it now looks as though the front will align from west to east, in tune with the upper level winds. This type of setup tends to marginalize the development of severe thunderstorms due to a lack of directional wind shear. The Storm Prediction Center has placed the northern third of the forecast area in a 2 out of 5 “slight risk” for severe weather. It would not be surprising to see this area confined more to the north given the aforementioned factors. What happens next is also still unclear. The GFS model brings the front into the Gulf of Mexico while the ECMWF model stalls the boundary north of Baton Rouge. With a stall occurring somewhere in the local area, isolated to scattered showers will stay in the forecast through early next week. Another strong storm system will enhance rain coverage and bring the possibility for severe weather on Wednesday. Above average temperatures will carry through the 7-Day Forecast from there.